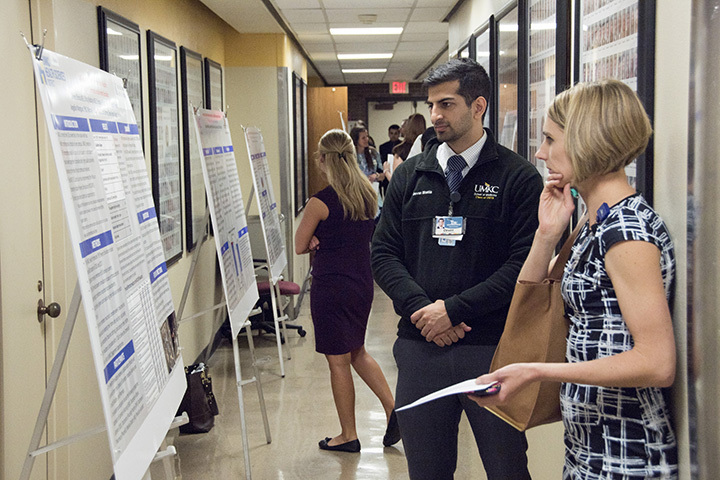 Students, residents and fellows presented 38 posters at the School of Medicine’s annual Vijay Babu Rayudu Quality and Patient Safety Day on May 11. Students, residents and fellows presented a record number of 35 research abstracts related to quality improvement and patient safety during the School of Medicine’s Fifth Annual Vijay Babu Rayudu Quality and Patient Safety Day on May 11. The event also consisted of a series of workshops and talks for faculty on subjects including hospital transitions of care activities, incorporating simulation and human factors analysis into health care training, and making educational and clinical training count twice. Carolyn Clancy, M.D., executive in charge, Veterans Health Administration, left, was the keynote speaker for the 2018 Quality and Patient Safety Day. Carolyn Clancy, M.D., Veterans Health Administration Executive in Charge, gave the keynote speech at noon. Clancy talked about the stride the Veterans Administration has made in providing health care for veterans and how it is a leader in health care innovations. The afternoon sessions were reserved for oral presentations and poster presentations by students, residents and fellows. The top two student and top two resident/fellow abstracts were selected for oral presentations. Fifth-year students Laura Meidl and Nyaluma Wagala were selected for student oral presentations. Omar Abughanimeh, M.D., and Talal Asif, M.D., gave the oral presenations by a residents/fellows. The top poster presentation awards were given to Salvador Rios, sixth-year student, for student poster, and Punita Grover, M.D., for resident/fellow poster. Second-place winners were Cindy Jiang, fifth-year student, and Parth Patel, M.D. Nyaluma Wagala, MS5; Emily Boschert, MS4: Alcohol Intoxication and Orthopedic Trauma: Who Provides the Counseling? First place: Salvador Rios, MS6, Amy Stubbs, MD; Monica Gaddis, PhD; Jason Hurt, MD: Are Women Diagnosed with ACS Under-Triaged? First Place: Punita Grover, MD; Eslam Dosokey, MD; Nikita Maniar, MD; Tarana Gill, MD; Siva Taduru, MD; Ashley Tatum, MD; Ginger Jenkins, PhD; Sheena Spielberg, MD; Julie Banderas, PharmD; David Wooldridge, MD; Kristin Gillenwater, DO: Standardizing the Process of Ordering Screening Mammograms in Primary Care Clinics. The University of Missouri-Kansas City School of Medicine is launching a consortium focused on patient safety in collaboration with its affiliated teaching hospitals. 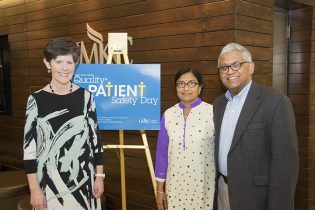 The UMKC Healthcare Quality and Patient Safety Consortium, an initiative created by the UMKC School of Medicine, includes faculty and teaching programs at Children’s Mercy, the Center for Behavioral Medicine, the Department of Veterans Affairs, Research Medical Center, Saint Luke’s Hospital and Truman Medical Centers. These six hospitals are the affiliated teaching hospitals for UMKC School of Medicine and already work closely with the medical school, providing residents, fellows and students clinical education and training. “This is an exciting opportunity to bring together our hospital affiliates in a coordinated effort to raise the bar even higher on the safety and quality of care we provide patients throughout our community and our region,” said Steven Kanter, M.D., dean of the UMKC School of Medicine. Betty Drees, M.D., UMKC professor of medicine and dean emerita, oversees the development of the Healthcare Quality and Patient Safety Consortium at UMKC School of Medicine, which also aligns with the purpose of the UMKC Health Sciences District, formed in 2017 as a cooperative partnership of 12 neighboring health-care institutions on Hospital Hill. The UMKC Health Sciences District supports research, grants, community outreach and shared wellness for employees, faculty, students and surrounding neighborhoods. In addition, UMKC is one of only 18 institutions nationwide that offers a medical school, along with a dental, nursing and pharmacy school, on a single campus. United in leadership, expertise, and resources in education and research, the consortium will lead scholarship and dissemination of local, regional and national activities directed to improve the quality of health care and patient safety. The consortium will focus on four key areas in quality improvement and patient safety: a robust curriculum for learners; infrastructure support for projects and collaboration; promotion of research and scholarship; and improving community safety. Activities of the consortium will be showcased at the annual Vijay Babu Rayudu Quality and Patient Safety Day at the School of Medicine. This annual event features updates on quality and safety by affiliated teaching hospitals; presentations of quality improvement projects by residents and students; faculty development workshops; and a keynote address by a national expert. This year marks the 5th annual Vijay Babu Rayudu Quality and Patient Safety Day, to be held on Friday, May 11, 2018, at the School of Medicine. Dr. Carolyn Clancy, Executive in Charge, Veterans Health Administration, will present the keynote address. For more information, contact Betty Drees at 816-218-2582 or dreesb@umkc.edu. UMKC School of Medicine improves the health and wellbeing of individuals through innovative programs in medicine, biomedical science, cutting-edge biomedical research and leadership in academic medicine. Academic options include an accelerated BA/MD program, an MD program, and master’s programs in Anesthesia, Bioinformatics, Physician Assistant, and Health Professions Education. Children’s Mercy Kansas City is one of the nation’s top pediatric medical centers, with more than 700 staff pediatric subspecialists and researchers. It provides the highest level of care for children from birth through the age of 21. The Center for Behavioral Medicine provides comprehensive psychiatric care to patients from Kansas City and the seven surrounding counties. Kansas City Veterans Affairs Medical Center is a patient-centered health care system with a 152-bed referral hospital and annex, six community-based outpatient clinics, and a mobile medical unit. Research Medical Center is among the only tertiary care centers serving Kansas City proper, providing residents in Kansas City and a 150-mile surrounding region with exceptional patient care and leading technology through a broad range of highly specialized, state-of-the-art services, including a Level 1 Trauma Center. Saint Luke’s Hospital of Kansas City has served the health care needs of Kansas City for more than 130 years. In addition to being a Level 1 Trauma Center, it provides top level, state-of-the-art care through a wide range of specialized clinical services. Truman Medical Centers is a two acute-care hospital health system, providing state-of-the-art health care to the Kansas City community. As an academic health center, TMC provides care from birth through senior years. It is the busiest Adult Level 1 Trauma Center in Kansas City.